Jill Andrew wants to start a fat revolution. When she was a kid, says Andrew, she used to play around with euphemisms to make herself feel better about her body—PHAT (pretty hot and tempting) was a popular one. “As I grew up,” says Andrew, “I realized, ‘No I’m fat.’ I’m fat, I’m beautiful and I’m talented and I’m accomplished.” She wants other women to feel the same way. 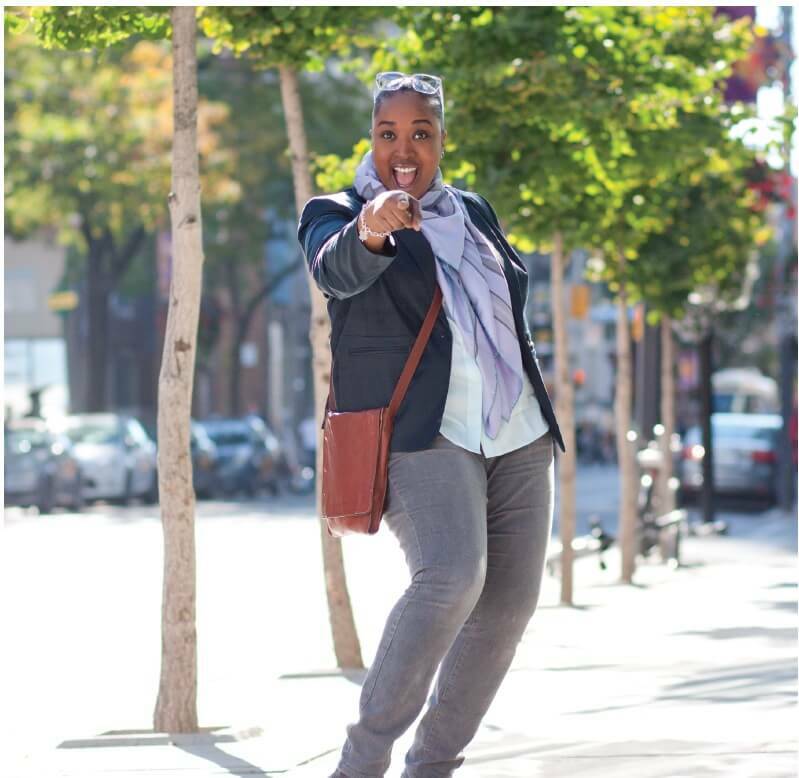 As part of promoting the size-acceptance movement in Canada, the 35-year-old Scarborough, Ont. resident has founded a bunch of fat-forward events and festivals, including the Bite me! Toronto International Body Image Film and Arts Festival and the Body Confidence Canada Awards. 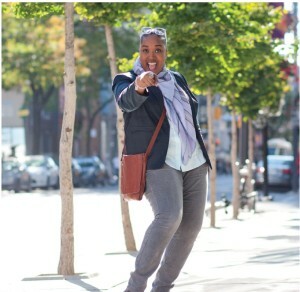 She also runs the fat fashion blog Fat in the City with her partner Aisha Fairclough, has won a slew of awards, and is in the process of completing her PhD. We caught up with Andrew in September to talk all things fat and feminism. On why fat activism has to be a feminist issue: Feminism for me is about exposing the patriarchy that we live in. It’s about exposing how sexism, racism, homophobia, classism, ableism: about how all of these -isms of inequity work together to hamper women’s lives, to silence our stories, and to create obstacles for us getting forward. Fat discrimination fits into all of those areas. It needs to be a feminist issue because that’s the only way it can highlight how women’s lives, particularly girl’s lives, are impacted negatively by size discrimination. On the grey areas of fat acceptance: There comes a point as feminists where we ask ourselves, ‘Hmmm. Where’s the grey area when it comes to promoting fat acceptance?’ We want to promote acceptance, we want to promote loving our bodies but, at the same time, part of the feminist project was that we didn’t only focus on the aesthetic and the material of our bodies. We focused on our minds, we focused on what our bodies could do: such as taking us to work, allowing us to buy property, allowing us to bear children, and allowing us to create policies to better women’s and girl’s lives. There’s a bit of a paradox. We want women to love their curves, love their rolls, and claim fat proudly. We want women to care about how they look—by that I mean care about loving the way they look—but at the same time we cannot lose footing on some of the, dare I say, ‘bigger’ issues. On using euphemisms, like curvy and plus-sized, for the word “fat”: These words make the fat body invisible. They depoliticize the fat movement, or the size-acceptance movement. The language waters down and makes the fat body invisible. What it is really is fat hate. It’s a message of: it’s there, we recognize it, but we don’t want to see it—so we dress it up and call it above average, call it something else, something prettier, something frillier, something that’s ‘mainstream’ that we can ingest. I’m not saying that these words—curvy, voluptuous, plus-sized—are the most terrible thing in the world. What I’m saying is that when we push those out first, and only those, to the detriment of calling fat fat, we lose the political and the personal element that fat has for us. We need to get the word fat out. F-A-T. Language is a tool that society uses to further the medical agenda of pathologizing fat as an obesity epidemic. Fat as the terriblest thing you can be in this world. Fat as asexual. Fat as out of control and irresponsible. And fat as loser. And all of these things we know are just not true. They’re just not true and we have to stop drinking the Kool-Aid. On the danger of “get healthy” campaigns: The sad thing is, I’m not against a healthy lunch. I’m not against fruits and vegetables, right? But where the problem comes in, is that the fruits and vegetables become a means to an end, and that is: lose weight, lose weight, lose weight. What the means to the end should be instead is: Have healthy food, your brain functions better. It shouldn’t just be about the looking body. It should be about the doing body. What are we doing? On privilege: I do not tell children it’s what’s inside that counts. That’s a phony piece of reality to give a child in this consumerist culture. What I tell them is these are the images you’re going to see and are going to be told are better: white is better, thin is better, able-bodied is better, straight (as in heterosexual) is better, straight teeth are better. These are all the messages you’re going to get. If you happen to fit into those categories, it’s not your fault. You can’t be blamed because you’re white; you can’t be blamed because you have straight teeth. What you have to recognize, though, is that you have a certain amount of privilege having any of those boxes checked off. Therefore your responsibility becomes: How do I use this privilege to educate and draw awareness to the fact that all those who don’t have those boxes checked don’t have that privilege? On who should be the face of plus-sized fashion blogs: We have to be able to say, ‘Who’s getting the press? Who’s being put out there as the face?’ It’s not the 50-year-old, it’s not the First Nation, Metis, or Inuit blogger. Even though size is being put out, we also have to be critical of how it’s being put out. We don’t want to just recreate another Marilyn Monroe, but this time fatter. We want to show there are women of all sizes, all races, all abilities, and all ages who are actively participating in the consumer culture of plus-sized fashion. On keeping the body-size acceptance movement diverse: It’s all about getting the histories of women out. If we’re not careful—if we create yet another pigeon hole with the plus fashion thing, the industry thing, the blogger thing—we run the risk of silencing yet other groups of women, too. That’s the scary, cautionary tale that we have to hold onto. It’s okay to love our size, it’s okay to promote the social aspects of the movement, but we have to keep a political and a critical head on our bodies, as well. And that means ensuring that diversity’s present, that it’s not tokenistic, and that it’s intersected: that we’re telling many stories, and not letting one story encapsulate all of them.